There is a tremendous range in the types and qualify of data used for GIS analysis. As essential components for planning, visualizing, analyzing, and operating a network, telecommunications and wireless maps must be current, accurate and from a trusted source. Keep your maps up-to-date with a digital data update subscription. Updates are available quarterly, semi-annually, or annually for most products. SGSI works with some of the world’s leading data providers to ensure our clients can rely on having the right data when they needed it. We offer quarterly, semi-annually, or annually subscription-based updates for most products so maps stay current. We offer mapping software and custom application development to extract the mission-critical data for Location Analytics that drive business forward. Area codes, aka “NPAs”, are the most familiar telecom geographic boundary. They change frequently, as new NPA’s are added or existing boundaries are split. More recently, “overlay” area code boundaries have also been superimposed. AreaCodeInfo™ offers the most up-to-date view of these well known telephony boundaries. AreaCodeInfo™ includes both the US and Canada. Wireless carriers using PCS technology are licensed to serve markets defined by BTA (Basic Trading Area) and MTA (Metropolitan Trading Area) boundaries. The MTAs include from 1 to 23 BTAs. Taken together, they cover the US, the Gulf of Mexico, and US territories. Post-auction market partitioning and the disaggregation information for PCS licenses. Competitive analysis to determine markets and population controlled by a national carrier, not just formally owned by the carrier. Demonstrate the percentage of a population served: e.g., “market saver” analysis. Wireless carrier revenue sharing/apportionment based on coverage within defied licensed markets. Wireless carrier merger & acquisition analysis. Media & advertising targeting for phone-based add-on services (LBS). Prepared in conjunction with Acxiom Corporation, Business Points is a comprehensive mapped database of more than 13 million businesses in the USA. Each data record includes company name, address, industry category (NAICS code), employee size category and parent company sales levels. All business records are mapped, and locations are pinpointed with street-level accuracy in approximately 90 percent of the cases. 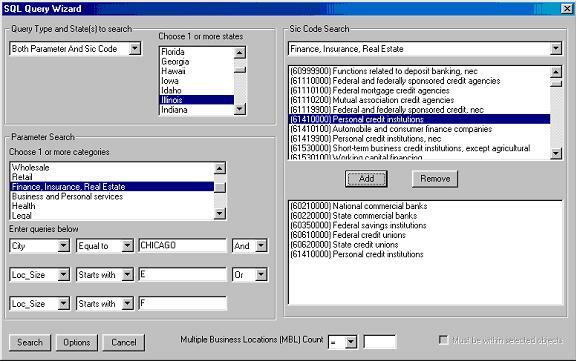 Business Points ships with query software for sub-selecting business records by company name, SIC (business type), and geographic area. Flexible licensing terms are available including the ability to authorize business points for a single state or a single one of 16 industry SIC categories. Create marketing lists comprised of businesses within five, 10 or 50 miles of your outlets. Identify companies within your paging, cellular or DSL service area. Plan alignment of fiber network or location of wireless broadband hubs based on proximity to particular types of businesses. Evaluate your alternative business sites based on proximity to target companies. Telecom demand estimates incorporated in this product are prepared by GeoResults, Inc. and are modeled based on proprietary techniques. Data does not include the name of the telecom provider for each business. Determine market share by comparing total demand to captured demand. CarrierInfo™ allows companies to identify, visualize and analyze the U.S. holdings of traditional and non-traditional wireline phone companies, along with wireless coverage. This set of maps details the operating territories for the incumbent local exchange carriers (ILECs), competitive local exchange carriers (CLECs), and Wireless carriers. ILECs are the traditional wireline “phone companies” such as the “Baby Bells”. CLECs also offer local wireless phone service typically by leasing space on ILEC networks. CarrierInfo™ boundaries align with wire center boundaries in ExchangeInfo Plus™ so they can be used together effectively. 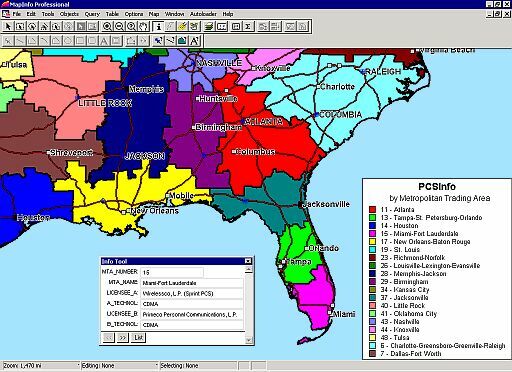 ExchangeInfo Plus™ include maps of the geographic areas served by wire centers. Each wire center serves a unique set of telephone number prefixes, aka NXXs, within its fixed geographic serving area. The ExchangeInfo Plus™ product also include data for each map boundary: e.g, the NPA or Area Code, plus a list of the NXXs associated with that wire center. Similar maps are available for Canada and Australia. ExchangeInfo Plus™ is the most comprehensive product available and includes CLLI™ Codes, LATA assignments, Rate Center names, Exchange names, and Carrier Type information, as well as the expected NPA and NXXs. ExchangeInfo Plus™ also includes a separate map of central office (CO) point locations. These point locations are more precisely positioned than would be possible using V&H coordinates alone. ExchangeInfo Plus™ is built using tariff data, Telcordia’s™ LERG™, StreetPro® street maps, and other reference data. Network implementation planning tasks such as wire center selection using the demographic profile of an area to determine the new equipment or services to be offered. ExchangeInfo Plus™ for Canada contains map boundaries for Canada’s telephone exchanges and the wire Centers (WC’s, a.k.a. “Switching Centers”) contained therein. Each wire center is associated with one or more NPA/NXX numbers (i.e. the area code plus the first three digits of the seven digit phone number) which are unique to that WC. Similar maps available for U.S. and Australia.